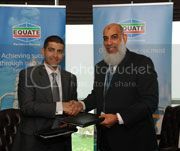 Equate Petrochemical Company, an international joint venture between Petrochemical Industries Company (PIC), The Dow Chemical Company (Dow), Boubyan Petrochemical Company (BPC) and Qurain Petrochemical Industries Company (QPIC). signed an accord with Gulf Cryo for Kuwait’s Second CO2 Recovery Project. Gulf Cryo will obtain CO2 from Equate’s plants to be converted and used for industrial purposes. It is investing heavily in Kuwait’s Shuaiba Industrial Area with a pipeline that will deliver the product from Equate’ s plants to Gulf Cryo’s production facilities. Gulf Cryo CEO Naji Skaf explained the process, stating that they capture the gas (from Equate) that contains raw CO2, then filter and purify it at their recovery plant, sited near Equate’s manufacturing complex. He furthered that the process separates CO2 and other gases to liquefy pure CO2, which is required in many industries, such as food and beverage, welding and cutting and in the manufacture of dry ice.